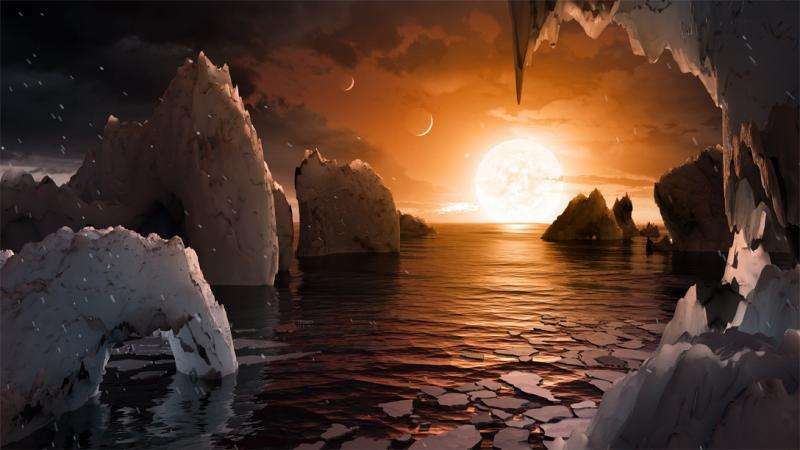 "Frequent material exchange between adjacent planets in the tightly packed TRAPPIST-1 system appears likely," said Krijt, the study's lead author. "If any of those materials contained life, it's possible they could inoculate another planet with life." For this to happen, an asteroid or comet would have to hit one of the planets, launching debris into space large enough to insulate the life form from the hazards of space travel. The material would have to be ejected fast enough to break away from the planet's gravitational pull but not so fast that it would destroy the life form. And the journey would have to be relatively short so the life form could survive. "Given that tightly packed planetary systems are being detected more frequently, this research will make us rethink what we expect to find in terms of habitable planets and the transfer of life—not only in the TRAPPIST-1 system, but elsewhere," said Fred Ciesla, UChicago professor of geophysical sciences and a co-author of the paper. "We should be thinking in terms of systems of planets as a whole, and how they interact, rather than in terms of individual planets." "The relatively new field of exoplanetology is exploding and being considered more seriously than ever," Ciesla said. "If we took the solar system as a model, we could never have imagined the things we're finding, such as the recent discovery of a planet that orbits two suns." Exoplanetary systems serve as laboratories to help scientists comprehend the solar system, Ciesla said, noting that 40,000 tons of space debris falls to Earth each year. 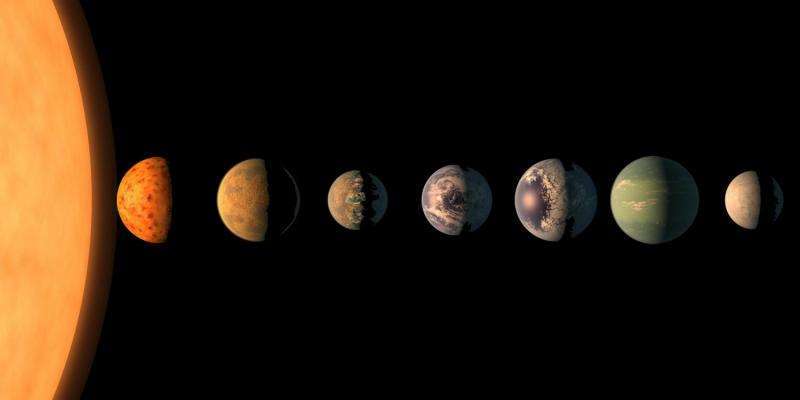 "Material from Earth must be floating around out there, too, and it's conceivable that some of it might be carrying life. Some forms of life are very robust and could survive space travel." Isn't this just the panspermia hypothesis that's been around for decades? It's cool and all, but I fail to see how this is novel research. Why it is novel is that the transfer of life could be done over a short range like this just with the life forms that we have on earth now. The Tardigrade, or Water Bear, is able to go into a spore like form that we have tested and survives not only the vacuum but radiation conditions of LEO and could, for the short distances and times considered, survive being transported in this manner in such a spore like form. And that is a rather high form of life, considering. Simpler forms such as bacteria or algae may survive even easier. Panspermia is the idea of crossing lightyears for life, this system entails orbits smaller than that of Mercury so it rather defines a smaller area and we have now actually found a system where this COULD work, rather than just being totally thought games. Isn't this just the panspermia hypothesis that's been around for decades? Panspermia has the problem that it has not been shown that life can survive for the length of time it would take to get from one system to the next (consider that something travelling reasonably fast - like the voyager probes - will take more than 300k years before coming even close to another solar system). I stand corrected. I was thinking of the theory that Mars could've seeded early Earth, but you are correct as "panspermia" refers to transfer between star systems.